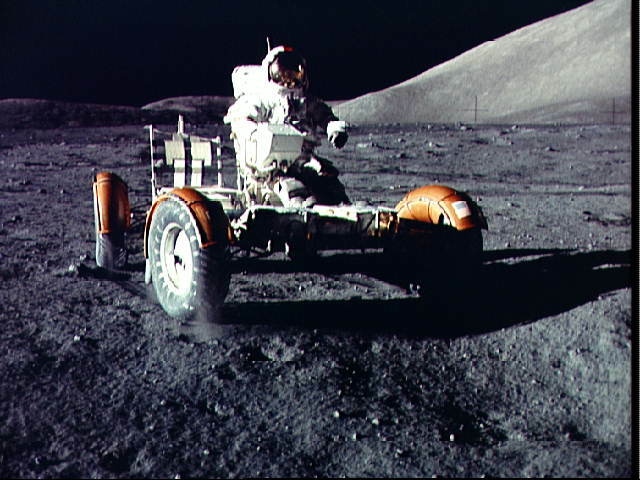 Astronaut Eugene A. Cernan, Apollo 17 mission commander, makes a short checkout of the Lunar Roving Vehicle during the early part of the first Apollo 17 extravehicular activity (EVA-1) at the Taurus-Littrow landing site. This view of the "stripped down" Rover is prior to loadup. This photograph was taken by Scientist-Astronaut Harrison H. Schmitt, lunar module pilot. The mountain in the right background is the east end of South Massif.